The recipe was on the side of the box and that is how we had pancakes. I loved them as a kid and I love using Jiffy to make corn bread. Sometimes you just have to pull out the box. So being the weekend I thought it would be fun to make my mom's Jiffy corn pancakes and see what my daughter thought of them....well they were a big hit...just like when I was a kid!! 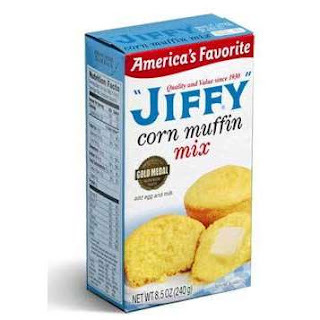 I was telling my sister that I made mom's corn pancakes and she asked "Did you use Jiffy Corn Muffin Mix?" It sure makes it easy and why mess with it. Mix the dry ingredients then add the wet and stir together, don't over-mix. Make sure your griddle is hot before you pour the batter on it. When you start to see the bubbles, flip them over. Now for the syrup...I have never made jam or jelly before and I really wanted to try. I do eat jam on toast with almond butter, but I use it sparingly so it's not too sweet. I wanted to try something a little different so I thought it would be fun to make lavender jelly. Well I tried and it didn't set up. Then after reading... it said to wait two weeks because it could take that long before it sets. So that's what I did, as long as it seals it is okay to do this....and it didn't set up. After following the direction on how to remake the jelly and doing a lot of reading, that's what I did. It even said sometimes it just doesn't set up...even for experienced jelly makers...this sometimes will happen. Then you just say you made syrup! So I made Lavender Syrup! I must say... it was really good! It was so good on the corn pancakes (which is now on our breakfast menu). I used a jar that really didn't seal so I popped it in the fridge and used it here. After awhile the rest of my jelly did set up some I will let you know if it works on toast! of course if you are making syrup I would leave out the pectin and cook everything with the lemon peels and cook it to the right consistency. It brought back such good memories. Funny how food can do that. We didn't have much of a sunset tonight, but it was still a beautiful evening at the beach. ...the moon even was out. Have a wonderful evening! Wow, great beach pics and sweet looking pancakes. I too am not a huge fan of the sweet breakfast but since moving to the U.S. I have began to quite like it now and again. Love you photos of your perfet beac; this looks so good; you are introducing me to new taste sensation; thank you! Wow that lavendar syrup sounds amazing! There are so many things i want to pour it over! What a great way to make pancakes! I love the lavender syrup. Sounds so good. I will have to try this next time I make pancakes! Your beach photos are beautiful, Lyndsey. The waves and clouds are so pretty with the light reflecting off of them. I've never tried a lavender syrup but imagine its delicious with corn pancakes. coincidentally, i also just posted pancakes but chinese type of pancakes.. 2 weeks to set the jelly? that's really long time. I'm sure your syrup taste just as good! lyndsey, i also wish i could be there at the beach, did i remember you saying that you lived very near the beach? have a good week. I am definitely not into sweet breakfast too! This is wonderful, Lyndsey..cornmeal in the pancakes! Would love to try this weekend. love the seet tinge to everyday breakfast ! first time visitor to this space and loved it !! Gloria, thanks so much, I love that you comment here everytime. I really appreciate your support. Nathan, I hope you enjoy it. I grew up eating these and am so glad that I brought them back. Belinda - the syrup actually tasted great! Foodness Gracious - thanks, I always have to throw some beach pics in my posts, I take photos each time we got can't help myself. Ann - it did turn out good, I know you'd like it. Rita, thanks I think this is perfect for you to try! Joanne - I am very happy with it, let me know what you use it on! Beth - I hope you try it, let me know how you like it. Diane - Let me know how you like them. I will be making them again soon. Cathy - I am so glad that you like the beach photos. Surprisingly the two flavors did go togehter nicely! Lena - I did check out your pancakes and now I have to make them Yum! TKW - Great! Hope you like them! Kalyani - It is nice meeting you. So happy you like it here, thanks for stopping by, hope you come back soon. This looks uber-amazing! I may even have to cook this for dinner! Breakfast for dinner... I know... but they look that good! Yay for jelly Lyndsey! I haven't tried plain lavender - yet. But I bet it won't be too long. Syrup sounds delish. What a wonderful family memory passed on to your daughter. Food truly connects us through time, space and hearts. I must give these corn cakes a try and am intrigued with the lavendar syrup (jam). I don't nearly get enough beach time, even though it is just a few miles from my door, so adore your cool blue reflections of the day bidding us adieu. What a lovely post Lyndsey! What a lovely post Lyndsey! I especially enjoy recipes that connect us in hearts and senses. Well done! Lyndsey, I have never tried lavender syrup before. I wonder if they even available here. I like recipes that are passed down, there are very sentimental!